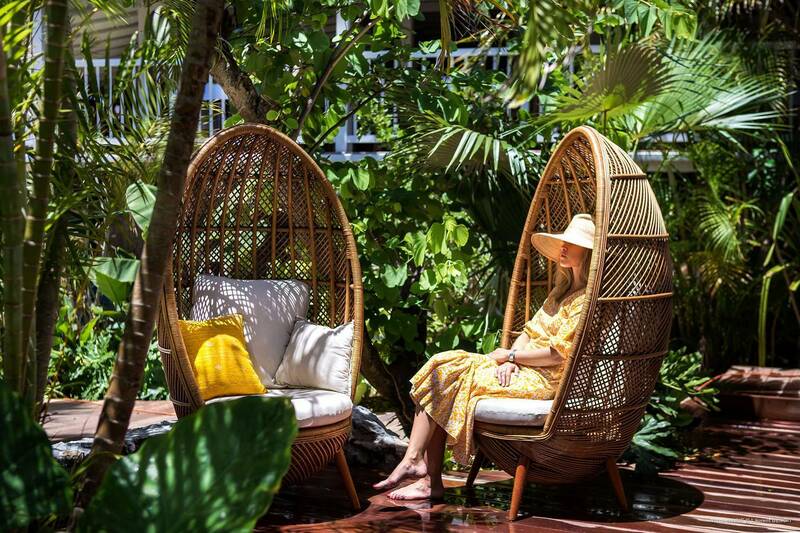 Those who traveled to St. Barth in the ’90s and aughts may well remember the Hotel François Plantation, and perhaps dined at its famed restaurant. 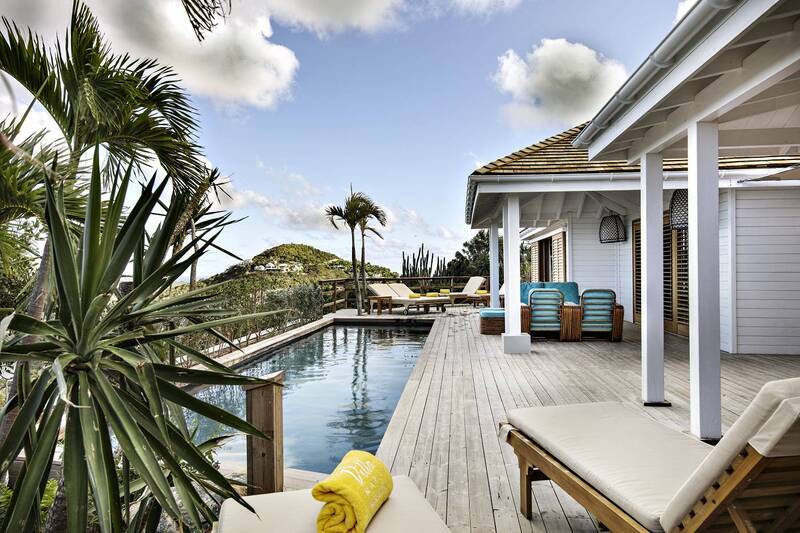 Nestled in the hills of Colombier, the property overlooks gorgeous Flamands Beach. It’s little wonder it caught the eye of the Sibuets, a family of hoteliers who founded the French luxury group Maisons & Hotels Sibuet. 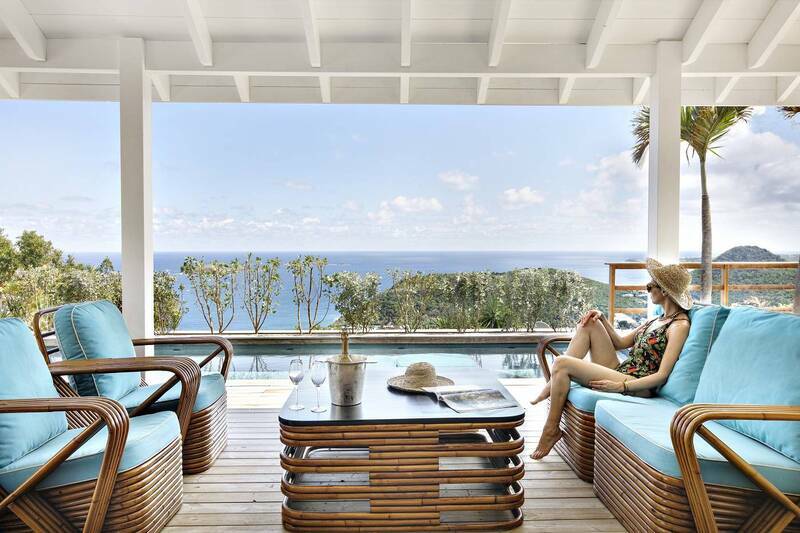 They bought it and created a stunning 5 star boutique hotel embodying their signature intimate and authentic ambience. They named it Villa Marie Saint-Barth. 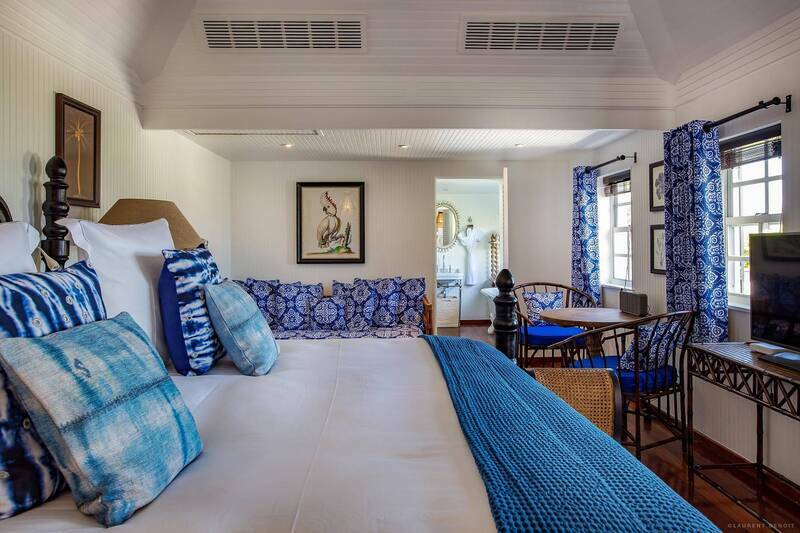 The hotel honors the West Indies architectural style, which blends the transition of indoor and outdoor spaces, and the colonial plantation character. 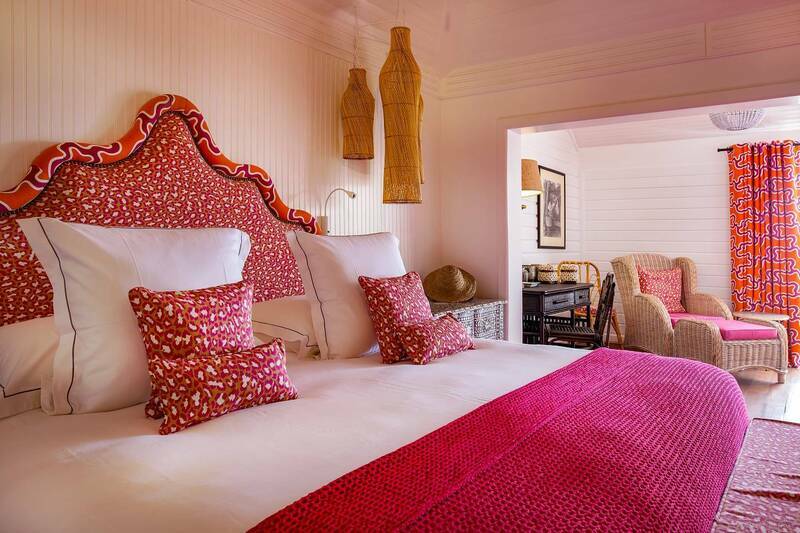 Bright Caribbean colors enchant the eye, and a soupçon of French elegance completes the picture. Idyllic. 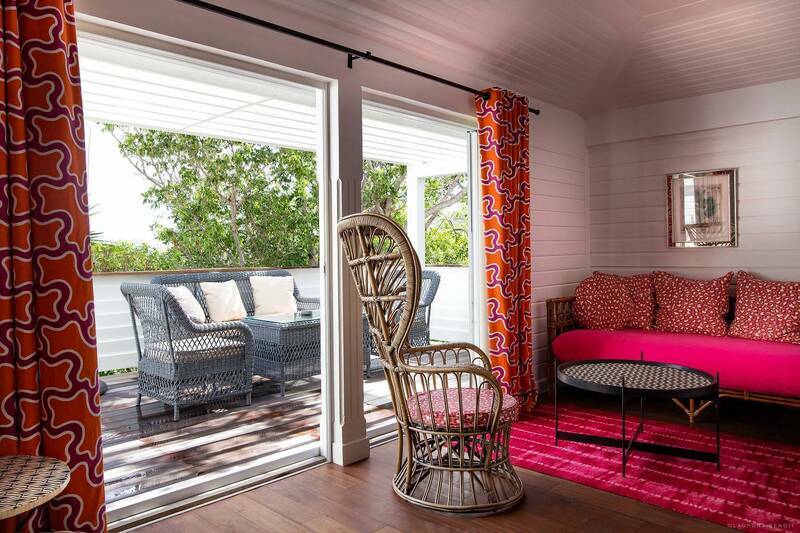 There are 19 charming verandaed bungalows. 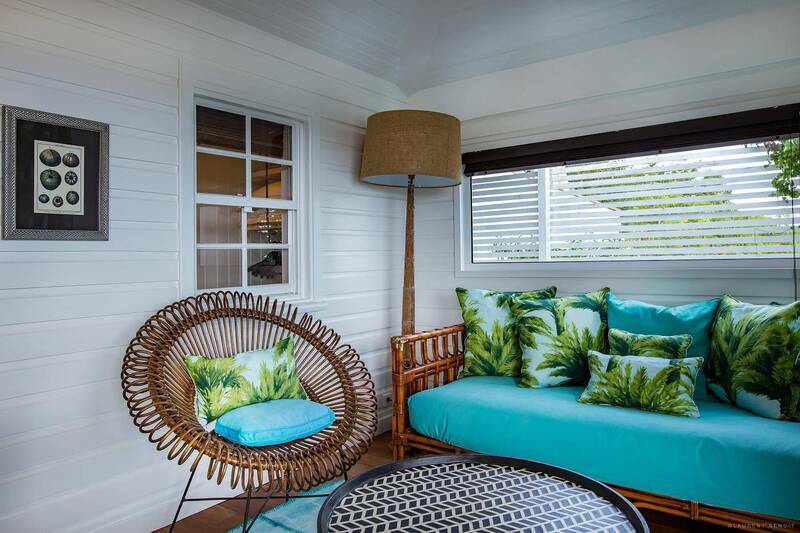 Some have a view of the exotic, lush tropical gardens, and there are three options for ocean views, including a Family Bungalow. 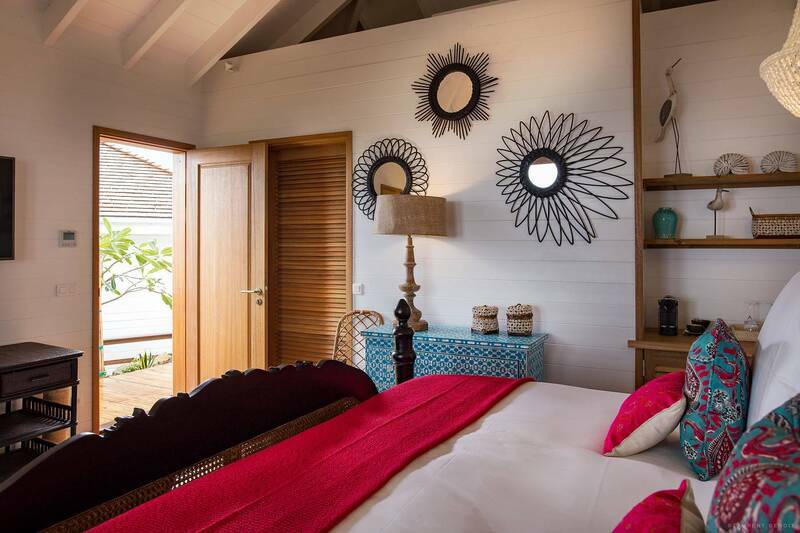 A villa with two en suite bedrooms is ideal for friends to share. 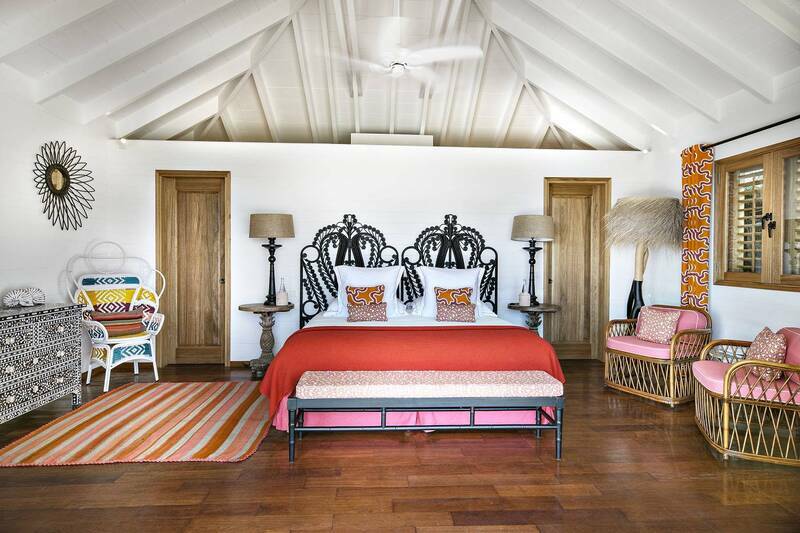 Whitewashed walls, colonial woodwork, rattan furniture and vintage pieces throughout combine for a boho chic vibe. Guests enjoy lunching at the poolside restaurant and “chatting” with resident parrots Jaho and Mahé. 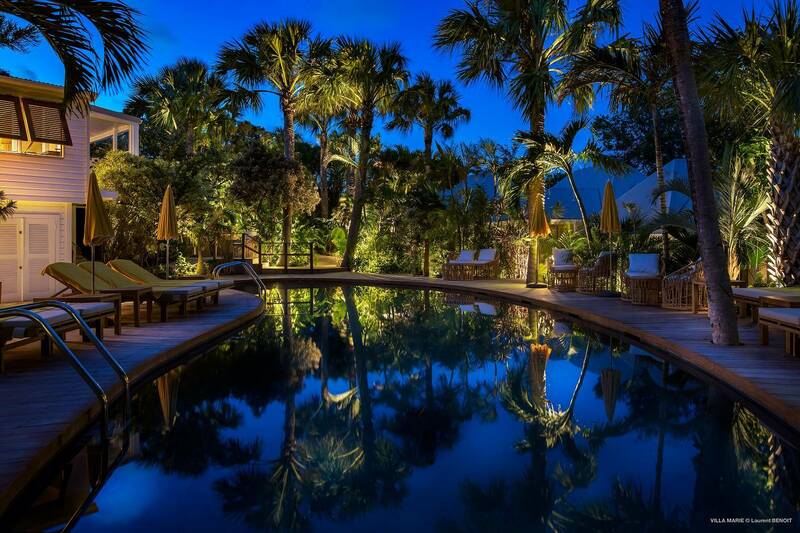 The pool is a delightful spot to while away an afternoon, and browsing in the boutique is fun. The Pure Altitude-branded spa is an oasis offering an extensive menu of treatments and packages. 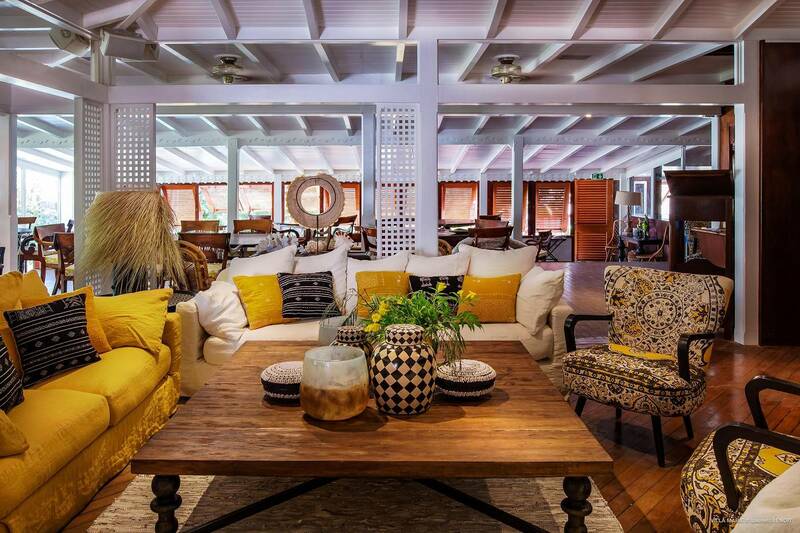 Villa Marie has named its dinner restaurant François Plantation in homage to its predecessor. 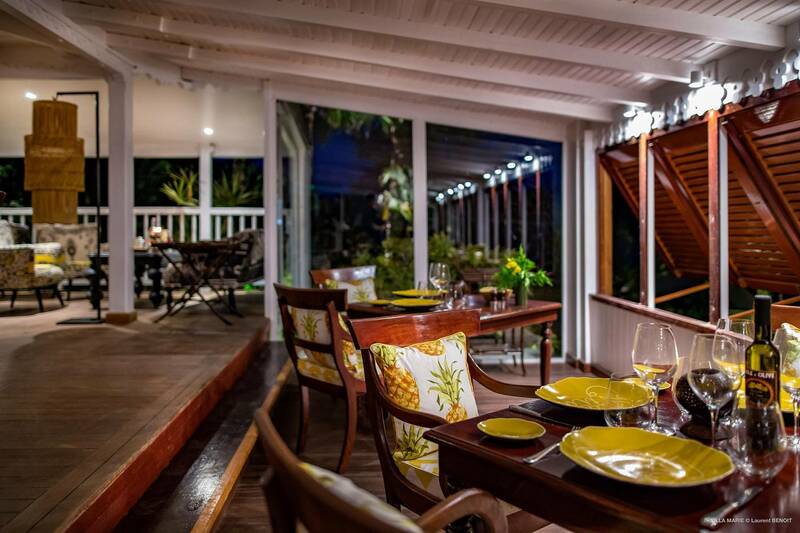 Fine French cuisine and reinterpreted heirloom Caribbean recipes are served in a romantic setting. The hotel’s cozy bar offers an extensive selection of the region’s rums and, fittingly, a humidor filled with Cuban cigars. 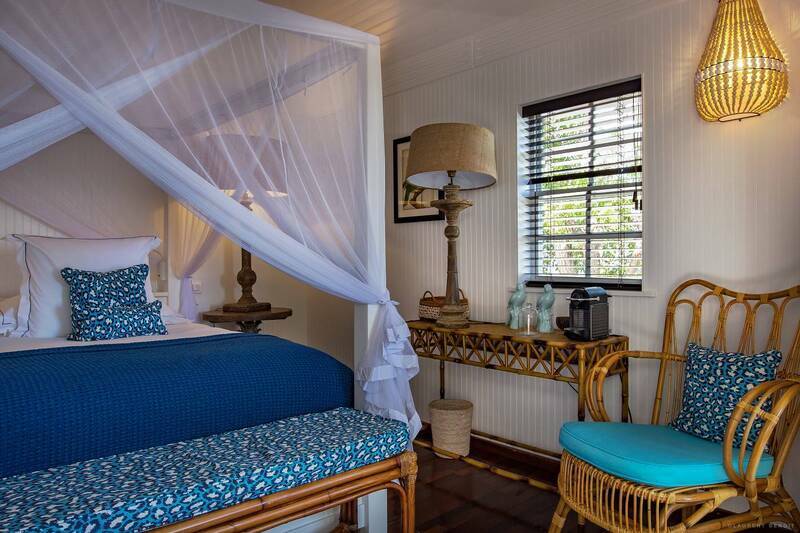 45m² / 2-3 guests The Plantation Bungalows are designed in a colonial spirit, decorated with exotic fabrics and colorful patterns, and offer a 4 poster king-size bed and a bathroom with a shower and bathtub. 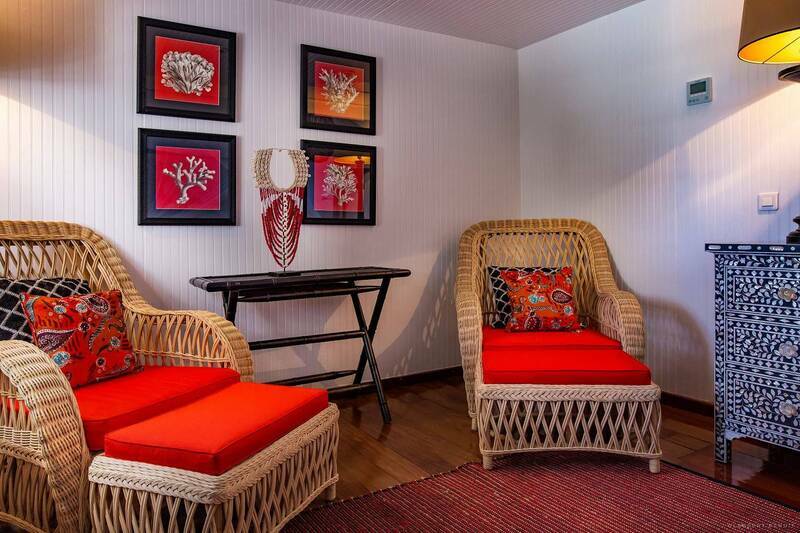 These bungalows have comfortably furnished terraces overlooking the garden and the pool. 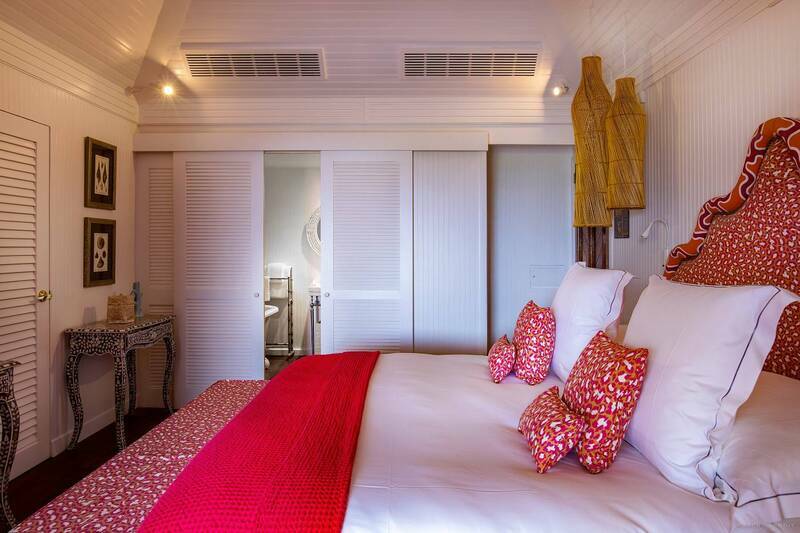 49m² / 2 guests Caribbean Bungalows are decorated in a chic tropical style with a collection of beautifully crafted fabrics and custom-designed furniture, such as a 4 poster bed or a majestic head board with colorful and bohemian tones. 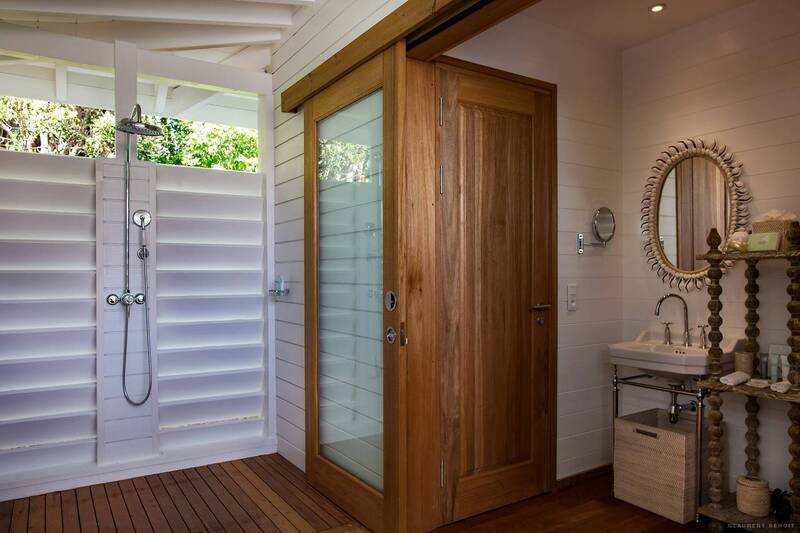 Bathrooms have a shower and bathtub. 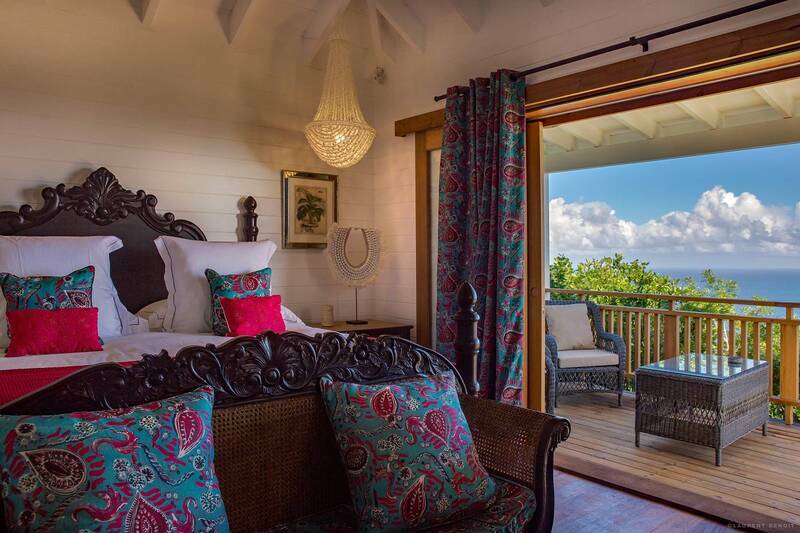 Each Caribbean Bungalow has a large, comfortably furnished terrace and a view of the magnificent Flamands Bay. 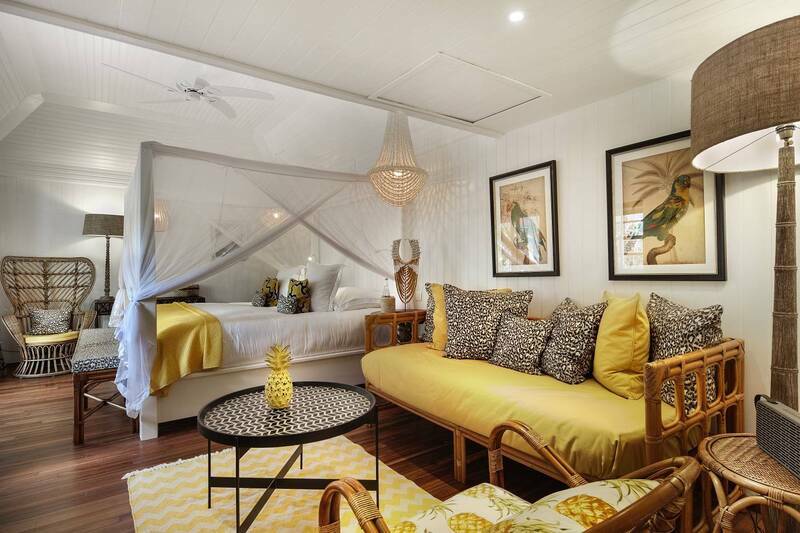 49m² 2 guests Decorated in boho chic style, the Tropics bungalows enjoy panoramic ocean views, custom-designed furniture, handmade headboards with tropical touches, bathroom with shower and outdoor bath. 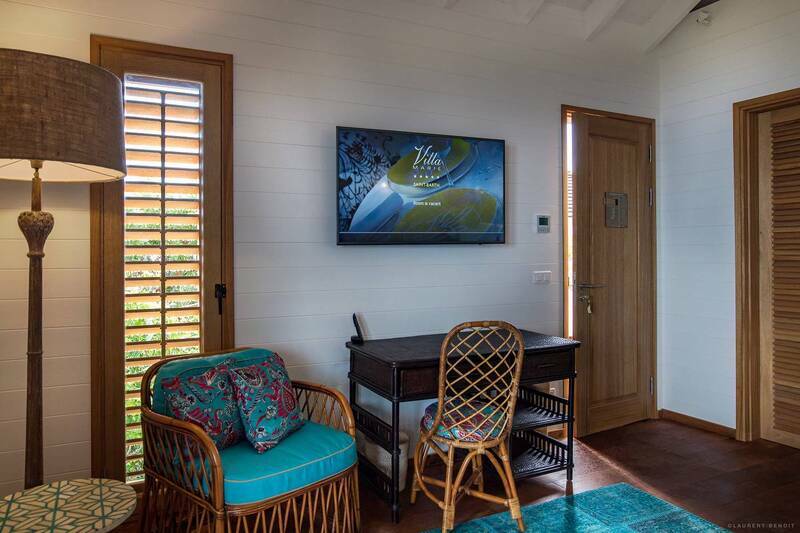 The 38m² Tropics bungalows also include spacious 11m² suspended terrace, set between earth and sky, to savor the breathtaking ocean vistas. 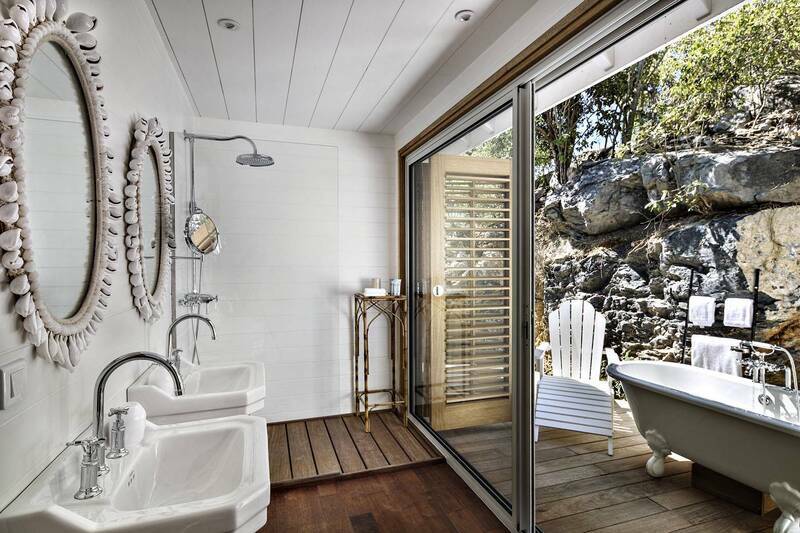 Bathrooms have a shower and bathtub. 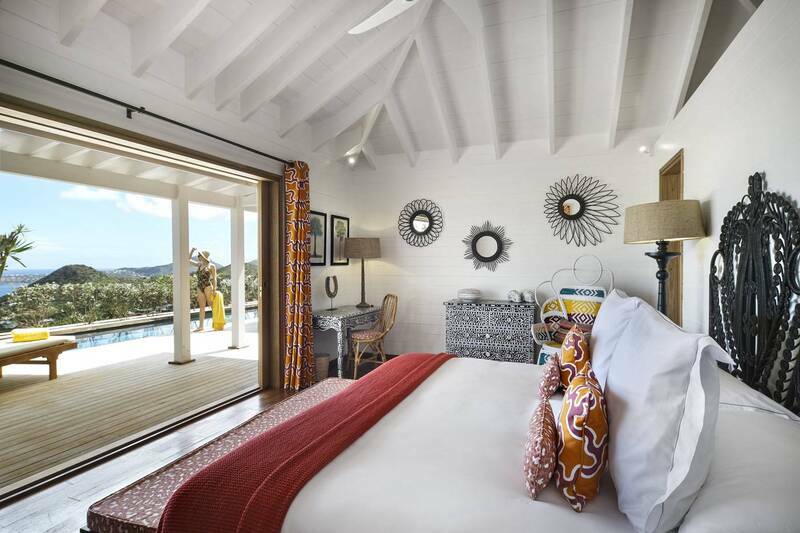 Each has a large, comfortably furnished terrace and a view of the magnificent Flamands Bay. 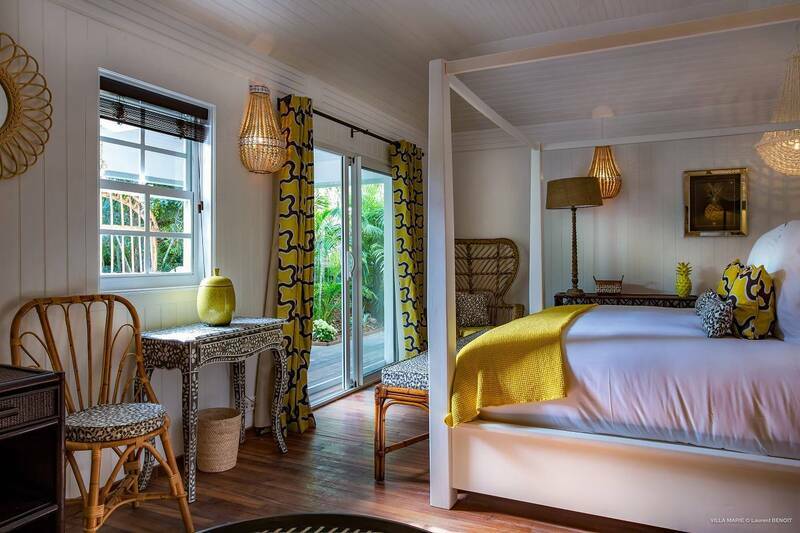 54m² / 2-3 guests Bright colors and exotic printed fabrics decorate the Prestige Caribbean Bungalows which consist of a bedroom with a king-size bed, a living area, a bathroom with a shower and bathtub, and a comfortably furnished terrace overlooking the blue horizon of the Caribbean Sea. 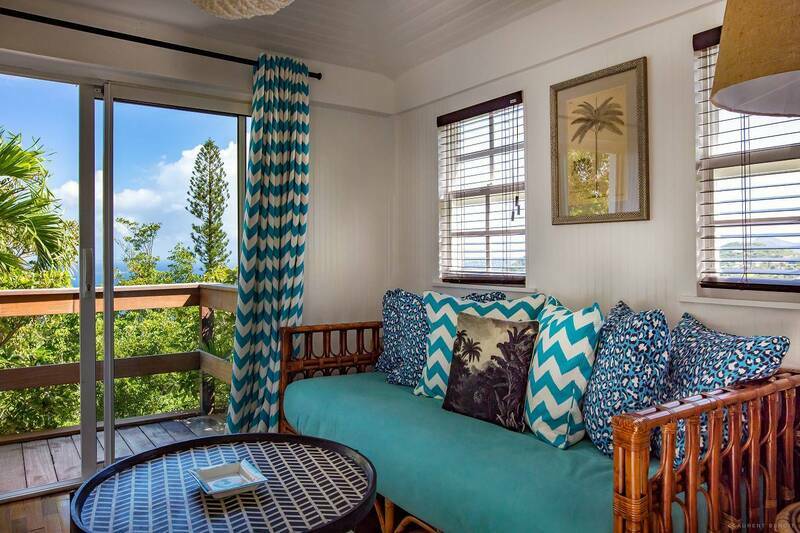 The living area of some Prestige Caribbean bungalows can accommodate an additional guest. 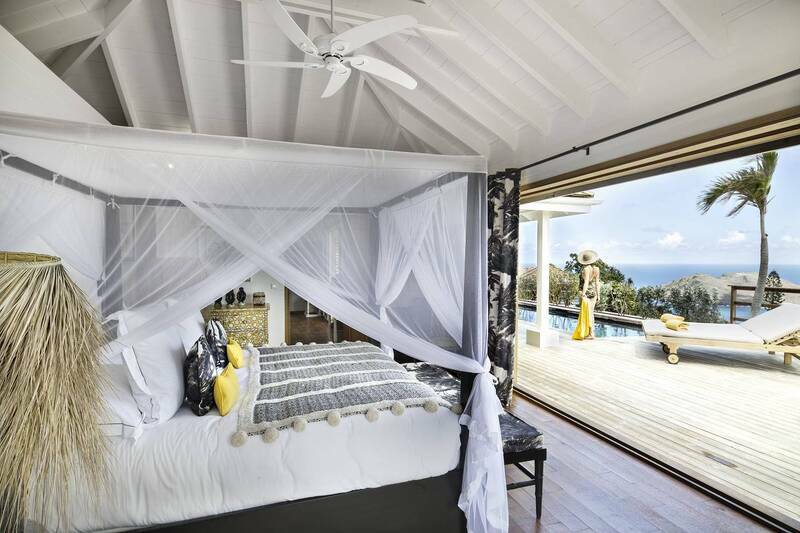 76m² / 2-4 guests The Family Bungalow is composed of a bedroom with a king-size bed, a bathroom with a shower and bathtub, an open living room with a sofa for one guest. A small adjoining room with a twin bed has a bathroom with a shower. 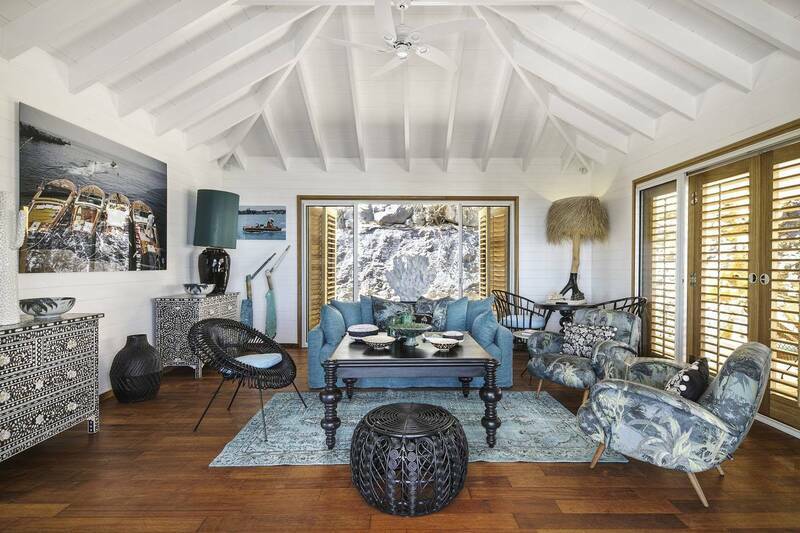 A comfortably furnished terrace overlooks Flamands Bay. This bungalow, with its bohemian and tropical atmosphere, is perfect for a memorable family holiday. 118m2. 4 Guests. 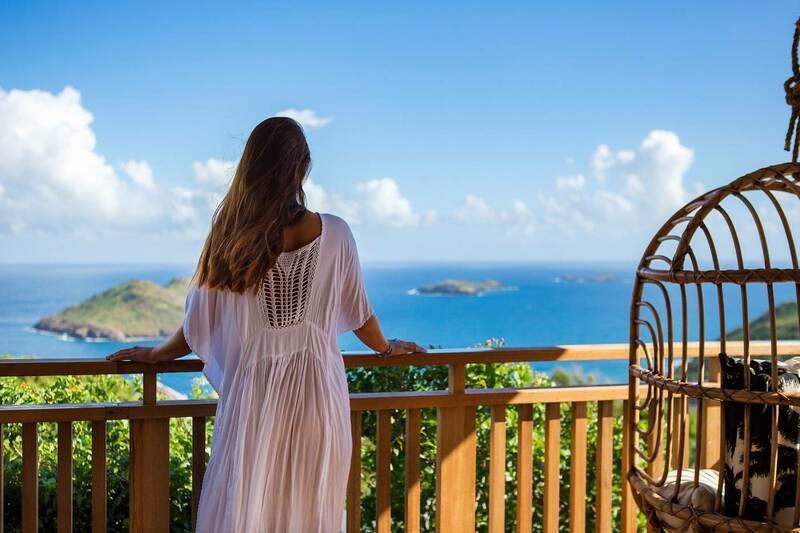 The Villa Saline invites you to fully experience the spirit of Saint Barth with its breathtaking Flamands bay and sea views. The living room opens onto a large covered terrace with a Jacuzzi is surrounded by beautiful tropical gardens. 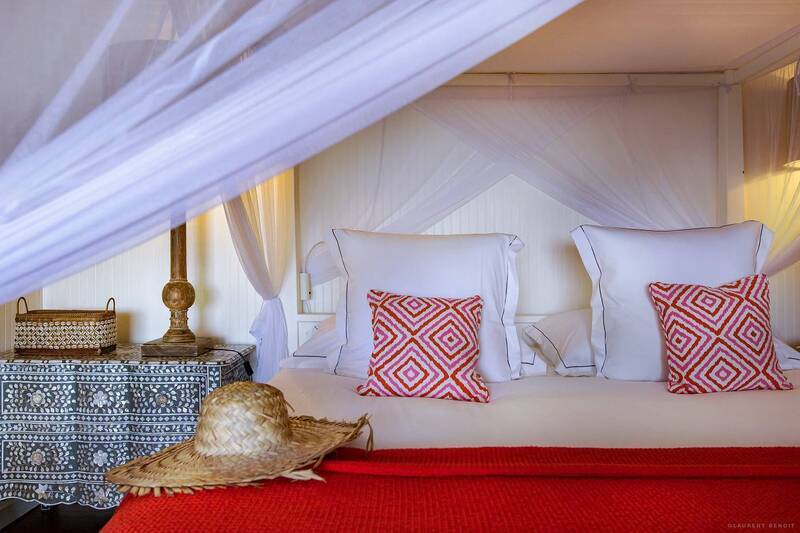 The villa is ideal for a family holiday with its two bedrooms and two bathrooms each with shower: colonial bed and handcrafted rattan headboard, shades of indigo blue and peppy Copacabana fabrics from French designer Lalie, handmade leather trunk furniture... an irresistible invitation to travel. 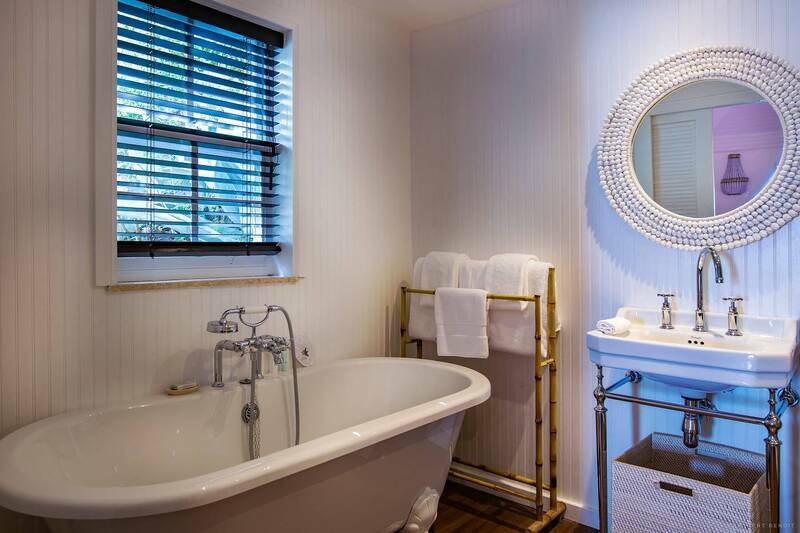 Villa Marie offers pampering, relaxation and restoration in its Pure Altitude - branded Spa. It features two treatment rooms. Developed in harmony with the environment, its signature product line incorporates all the benefits of mountain plants and minerals with antioxidant and remineralizing properties. The menu of treatments is extensive and includes several packages. The Pure Altitude product line is available for purchase. 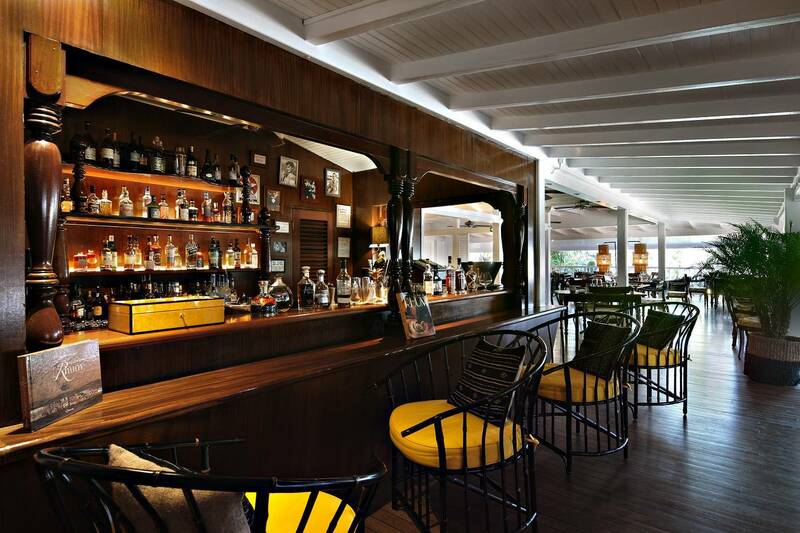 François Plantation Rum Bar & Restaurant pays epicurean homage to its predecessor, which was famed for its cuisine. Now under the direction of Chef Emmanuel Motte, it’s establishing its own fine reputation. 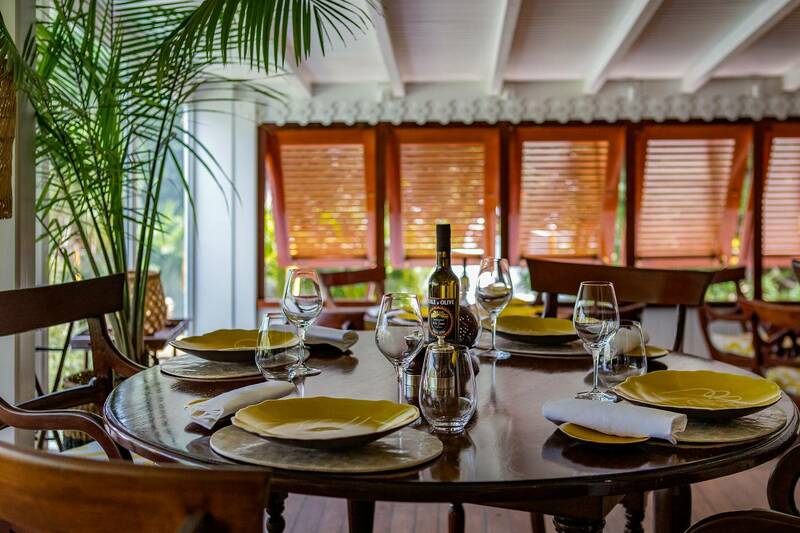 The menu combines elegant traditional French dishes and heirloom Caribbean recipes. The setting is sophisticated – and romantic. The cozy bar stocks an extensive list of the region’s best rums. 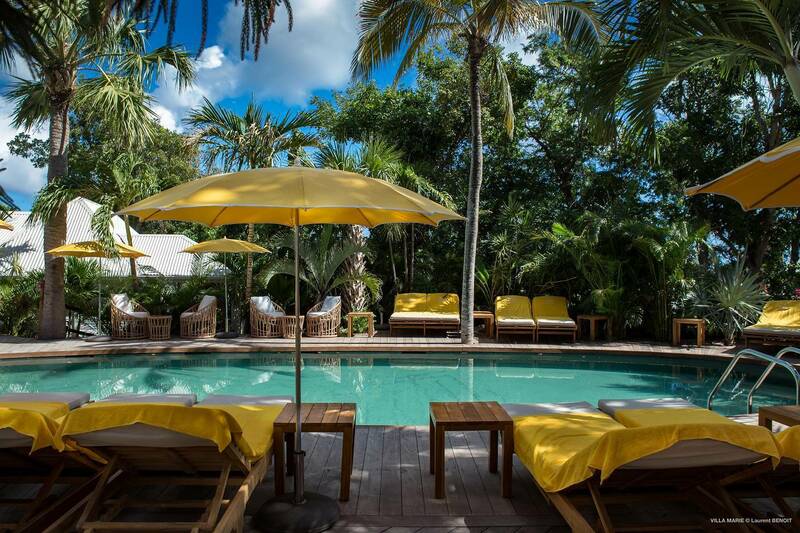 Breakfast is served in the François Plantation and at the poolside restaurant which also serves lighter fare and a selection of daily specials for lunch. A pair of parrot sweethearts Joho and Mahé hold court at the aptly named Parrot Bar. 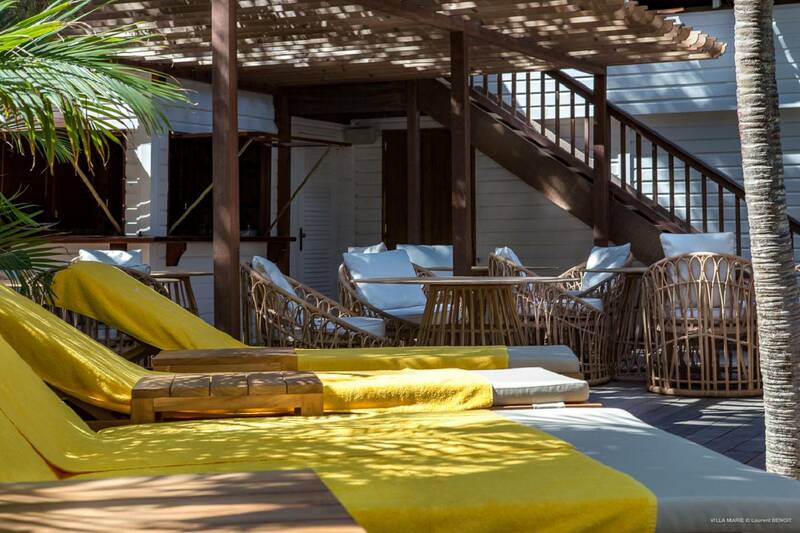 It’s an ideal spot to enjoy a tropical cocktail or a glass of Rosé. * All off-site activities are at an additional charge.